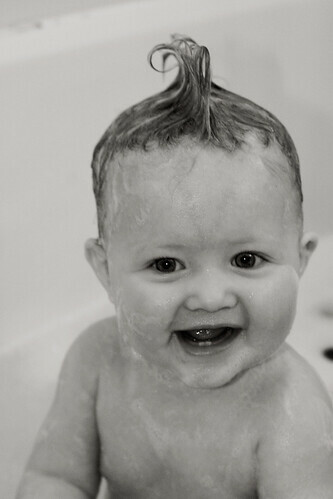 >My niece, Ellie, was visiting this past weekend and I was able to get some super cute pictures of her in the tub. Taking pictures of her is always fun because even though she's only 8 1/2 months old, she totally knows how to work the camera! The moment I lift it to her face she's smiling like a pro! Here she is rockin' the faux hawk. This one was taken later in the day after she was all fresh and clean.